The practice of shaving is often, if not almost automatically, associated with the use of products that either facilitate or complement it, or take into account specific and particular problems. In this contribution, we will gradually see the different typologies of products used in these practices. 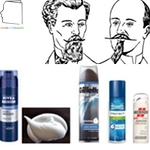 After the Second World War, the cosmetics industry invented instant shaving foam in aerosols. The first patent on this type of device seems to have been filed in 1953. The formula is a soap-based emulsion, made more liquid, and packaged in a metal can, pressurized by the addition of a propellant gas and closed by a valve. The outlet head (push button or actuator) of the valve is designed to allow instant foam expansion. The formulation principle consists in the propellant gas being soluble in one of the phases, the fatty phase in general. When the product is released by action on the can valve, the propellant sublimates instantly, causing the product to expand by foaming. The quest for performance, speed and ease of use quickly led manufacturers to add agents to reinforce the foam's emollient action, especially in order to reduce the application time required. The addition of softening agents in the formula also compensates for the relative chemical aggressiveness of the instant shaving foam. The 50's to 80's saw the birth of many cosmetic formulations, but without major evolution of the principle. Until the 1970s, the main propellants were CFCs, mixtures of dichlorofluoromethane (F12) and dichlorotetrafluromethane (F114). Since the ban on the use of CFCs in this type of application, the most common propellants are saturated hydrocarbons such as butane, propane or isobutane. These thrusters are more stable in the environment than CFCs, but they introduce many constraints related to their flammability. DI Water, Stearic acid, Triethanolamine, Isobutane, Laureth 23, Sodium lauryl sulfate, Propane, Fragrance, Butane, BHT. Formulation examples 2015 - Aqua, Isobutane, TEA-stearate, Propylene glycol, Laureth-23, Glycerin, Sorbitol, Coco-caprylate/caprate, Hydroxypropyl methylcellulose, PEG-7M, Potassium stearate, Butane, Propane, Piroctone olamine, Limonene, Parfum, CI 42053. - Aqua, Stearic acid, Triethanolamine, Palmitic acid, Glycerin, Isobutane, Laureth-23, Butane, Polysorbate 20, Propane, Myristic acid, Dimethiconol stearate, Allantoin, Polyquaternium-7, Linalool, Limonene, Hydrolyzed algin, Vitreoscilla ferment, Zinc sulfate, Parfum. In the 1990s, marketing studies highlighted the need for users to find a skin preparation gesture. 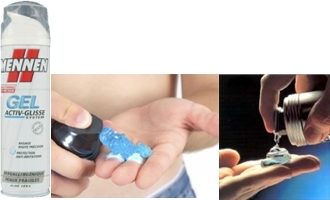 The formulation of the instant shaving foams has been modified to allow the foam to form under the fingers when the product is applied and not right out of the box. This is achieved by using a special technology called"post foaming". The principle consists in adding to a classic shaving foam formula a small quantity of a gas allowing the partial dissolution of the fatty phase until obtaining a transparent gel. This gas is generally a volatile hydrocarbon. A gas with an intermediate vapour pressure (isobutane or isopentane) is chosen so as not to cause the phenomenon too quickly. This product is then inserted into a pocket inside an aerosol can. These devices are known as pocket aerosols. An inert gas (nitrogen) is added to the can in order to compress the bag as the product is delivered. The product that is delivered is the gel incorporating the gas. At room temperature, the gas incorporated into the gel gradually evaporates, causing the gel to expand and form an abundant foam. The cult products in this category were EDGE Gel and CVS Pharmacy Shave Gel. Several female versions have also been proposed. These products remain very present on the market today on the basis of the same technologies. Edge® Gel Ingredient List DI Water, Palmitic acid,Triethanolamine, Pentane, Fatty acid esters, Sorbitol, Palmitamine oxide, Lauryl alcohol, Isobutane, Cellulose polymer, Fragance, FDC Blue 1, DC Yellow 10. Formulas year 2015 - Aqua/Water, Palmitic acid, Triethanolamine, Isopentane, Glyceryl oleate, Stearic acid, Parfum/Fragrance, Isobutane, Sorbitol, Hydroxyethylcellulose, PTFE, Menthol, Glycerin, Limonene, PEG-90M, PEG-23M, Propylene glycol, Bisabolol, Sodium PEG-7 olive oil carboxylate, Aloe barbadensis leaf juice, Silica, CI 42090/Blue 1, Zingiber officinale root extract, BHT. - Aqua, Palmitic acid, Laureth 23, Triethanolamine, Isopentane, Hydrogenated polyisobutene, Laureth 4, Isobutane, Glycerin, Aloe barbadensis, Parfum, PEG 10 soy sterol, Hydroxyethylcellulose, Poloxamer 407, PEG 14M, Propylene glycol, Tocopheryl acetate, Acetic acid, Polytetrafluoroethylene acetoxypropylbetaine, BHT, CI 42090. Contribution made by Jean Claude Le Joliff Trained as a biologist, Jean Claude Le Joliff was an R&D man for many years. Successively in charge of R&D, then Research and Innovation in a large French cosmetics and luxury group, and after an experience of creating a research centre (CERIES), he turned to innovation management. He has also been an Associate Professor at the University of Versailles Saint Quentin (UVSQ) and remains a lecturer in several specialized courses: ISIPCA, IPIL, ITECH, UBS, UCO, SFC etc. He is the founder of inn2c, an R&D and Innovation consulting company. Consultant for several international companies, he has actively participated in projects such as Filorga, Aïny, Fareva, and many others. He created the Cosmétothèque®, the industry's first conservatory of crafts and know-how.